Protecting your portable restroom from theft or vandalism is no easy task. Have you ever wished there was an easier way to keep out unwanted guests, especially during those hours when you’re not on site? Believe it or not, the solution to your problem is rather simple. That solution is to add a steel locking kit. These kits can quickly and easily be installed onto any basic portable restroom. We will retrofit your portable restroom with a stainless steel hasp. This hasp is installed onto the non-hinged side of the door and allows the user to easily slide a lock in and out of operation. The stainless steel construction is also rust proof and incredibly durable. 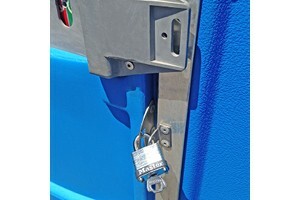 After hasp installation your portable restroom is ready for a lock kit.